The metroplex of Dallas/Fort Worth is a large urban area with a variety of attractions for the visitor, including museums and restaurants. This page has tips, photos and guides for traveling to Dallas/Fort Worth, Texas. What can we do in Dallas Ft. Worth on vacation? For free or cheap. We've been to the stockyards, I'm sure we'll go again, but anything else, any cool drives? Is there anything the area is famous for, like a mom and pop restaurant, something that a town is known for? White Rock Lake is worth a visit during the day. I have gone with my husband many times to Dallas when he's gone on business. There are many things to do. One place I recommend for eating is the "Trail Dust", great mesquite grilled steaks and all the trimmings. The prices are right too. Also for BBQ we like Riskies (I might be spelling it wrong). Tthere's a location at the Stockyards. If you're going when the rodeo is running, I suggest the Mesquite Rodeo. The Galleria Mall is a fun one to go to....very upscale type stores, but fun to window shop and there's an iceskating rink in the center. In nearby Grapevine there is a lake and also some outlets. In downtown Dallas there's some night life and there is the Kennedy memorial. You should be able to do a search online and find out more. I just thought of these things off the top of my head. Go to the Mandalay Four Seasons and check out the horse sculptures and the canal. Visit the Arboretum in Dallas on White Rock Lake. West End in Dallas is interesting to walk around. 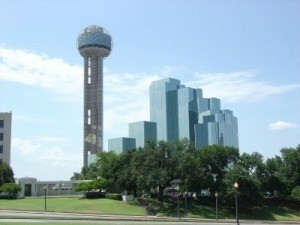 Go to the top of Reunion Tower in the glass elevator. Lots of lakes around to picnic, swim, etc. Outlets everywhere for shopping, check at www.undergroundshopper.com. If you are a menber of AAA or if you know someone who is go to AAA office and ask for a Ft. Worth travel book.These are free to AAA menbers.tThey have all kinds of info in them or go to a book store and browse the travel section.I am sure there will be a travel book on Ft Worth.